Apparently it’s dangerous to revisit your childhood Don Bluth favorites, because they don’t all hold up. 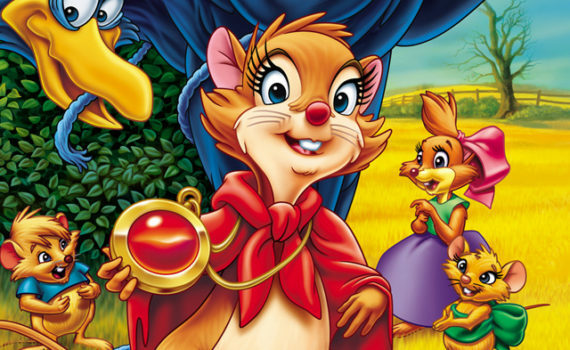 The Secret of NIMH doesn’t, An American Tail didn’t, The Land Before Time thankfully does, but I’m afraid to watch either All Dogs Go to Heaven or Rock-A-Doodle. Actually, NIMH was the first feature film he ever directed, and I understood why he made some of the choices he made, I enjoyed the movie as a kid, it just doesn’t translate to adulthood like some of the other classics do and like I hoped this one would as well. I just adore the book, I’ve read it so many times, and the movie takes a ton of poetic license. But it wasn’t that I minded, because I knew the film was very different than the novel. No, it’s simply that the adaptation isn’t very good, although I’ll always hold it dear to my heart. Mrs. Frisby needs to move her family into their summer home, because Mr. Fitzgibbon’s plow is coming, and their cinder block house in the garden won’t survive such a thrashing. The Frisbys are mice, and they live in the farmer’s field during the winter, moving into a lovely hole by the brook when the weather warms. But this time, they can’t move now that the time has come, because their frailest member, Timothy, is sick again, and can’t go out of doors in the chill or he might die. Mrs. Frisby, unsure of what to do and missing her late husband ever so much, seeks advice from a wise, old owl, who tells her to go to the rats in the rose bush. These rats know things that other animals do not, are advanced in a way that defies nature, and their story is one that Mrs. Frisby needs to hear, both because it might save her son and because it concerns the death of his father. When I was a kid, I loved the book and the movie equally; now I know better. Or, perhaps, if that isn’t quite fair, now I can only like one and not the either, the book being written for everyone, the movie made for children. I’ll always hold a place for Don Bluth, his work just doesn’t translate to adulthood, or perhaps the times have changed beyond recognizing. His stories are a little out there, over-the-top, loud, chaotic, and don’t stick to the central themes that made them attractive in the first place. This film is just too uncontrolled, when the book is so lovely in its simplicity. On a cool side note, and apart from the names you might have already noticed, like Dom DeLuise, both Shannen Doherty and Wil Wheaton provide young voices here, which I found interesting. Otherwise, stick to the book, avoid revisiting the movie, let the memory stick around a while longer.